In the preceding chapter, the control system and its functions were discussed in detail. In this chapter, some of the other components and their functions will be discussed briefly to give the readers some familiarity with the aircraft they will be flying. The transmission system transmits engine power to the main rotor, tail rotor, generator, and other accessories. The engine of a helicopter must operate at a relatively high speed while the main rotor turns at a much lower speed. This speed reduction is accomplished through reduction gears in the transmission system and is generally somewhere between 6 to 1 and 9 to 1 (that is, between 6 and 9 engine RPMs to 1 main rotor RPM). In a helicopter with a 6 to 1 ratio, if the engine turns at 2700 RPM, the main rotor turns at 450 RPM. 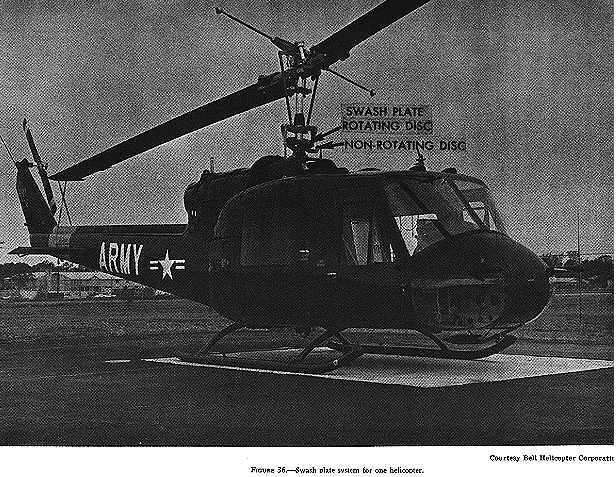 With a 9 to 1 ratio, if the engine turns at 2700 RPM, the main rotor turns at 300 RPM. 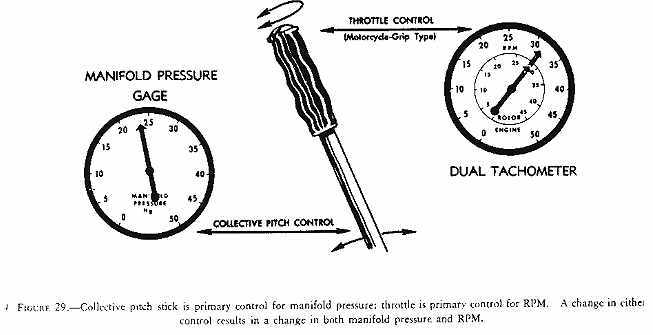 When the rotor tachometer needle and the engine tachometer needle are superimposed over each other (fig. 29), the ratio of the engine RPM to the rotor RPM is the same as the gear reduction ratio. In the conventional airplane, it is standard practice to have the engine and the propeller permanently connected. The propeller serves as a flywheel; there is no reason for the propeller to be at a standstill when the engine is running. In the helicopter, there is a different relation between the engine and rotor. Because of the much greater weight of a helicopter rotor in relation to the power of the engine than the weight of a propeller in relation to the power of the engine in an airplane, it is necessary to have the rotor disconnected from the engine to relieve the starter load. For this reason, it is necessary to have a clutch between the engine and rotor. The clutch allows the engine to be started and gradually assume the load of driving the heavy rotor system. THE CLUTCH DOES NOT PROVIDE DISENGAGEMENT OF THE ENGINE FROM THE ROTOR SYSTEM FOR AUTOROTATION. THIS IS PROVIDED THROUGH ANOTHER DEVICE. In this type of clutch, contact between the inner and outer parts of the clutch is made by the spring-loaded clutch shoes. The inner portion of the clutch, the clutch shoes, is rotated by the engine; the outer portion of the clutch, the clutch drum, is connected to the main rotor through the transmission. At low engine speeds, the clutch shoes are held out of contact with the clutch drum by the springs. As engine speed increases, centrifugal force throws the clutch shoes outward until they contact the clutch drum and motion is transmitted from the engine drive shaft to the input drive shaft of the transmission. The rotor starts to turn, slowly at first, but with increasing speed as the friction between the clutch shoes and drum increases. Slippage of the clutch will be experienced until this friction develops sufficiently to drive the drum at engine RPM. As the clutch becomes fully engaged, the rotor system will be driven at the equivalent of engine RPM and the rotor tachometer needle and engine tachometer needle will join or "marry," that is, one needle will be superimposed over the other. This type of clutch is manually engaged by the pilot through a lever in the cockpit. Power from the engine drive shaft is transmitted to the transmission drive shaft by a series of friction discs or belts. With this type of clutch, it is possible to start the engine and warm it up without engaging the rotor. The freewheeling coupling provides for autorotative capabilities by automatically disconnecting the rotor system from the engine when the engine stops or slows below the equivalent of rotor RPM. When the engine is disconnected from the rotor system through the automatic action of the freewheeling coupling, the transmission continues to rotate with the main rotor thereby enabling the tail rotor to continue turning at its normal rate. This permits the pilot to maintain directional control during autorotation. Figure 33 - Rotor blade pitch horns are located 90° ahead of or behind (depending on the manufacturer) the rotor blade so that helicopter reaction will be in the direction of cyclic stick displacement. The swash plate consists of two primary elements through which the rotor mast passes (figs. 34, 36, and 37). One element is a disc, linked to the cyclic pitch control. This disc is capable of tilting in any direction but does not rotate as the rotor rotates. This nonrotating disc, often referred to as the "stationary star," is attached by a bearing surface to a second disc, often referred to as the "rotating star," which turns with the rotor and is mechanically linked to the rotor blade pitch horns. The rotor blade pitch horns are placed approximately 90° ahead of or behind the blade on which they control the pitch change (figs. 34 and 37). If this were not done, gyroscopic precession would cause the movement of the helicopter to be 90° out of phase with the movement of the cyclic pitch stick, that is, if the cyclic stick were displaced to the right, the helicopter would move forward; if the cyclic stick were displaced forward, the helicopter would move to the left, and so on. The illustration in figure 33 shows the pitch horns 90° ahead of the blade in the plane of rotation. Figure 37 shows them 90° behind. Whether they are ahead of or behind the blade will depend on the mechanical linkage arrangement between the cyclic stick, swash plate, and pitch horns. 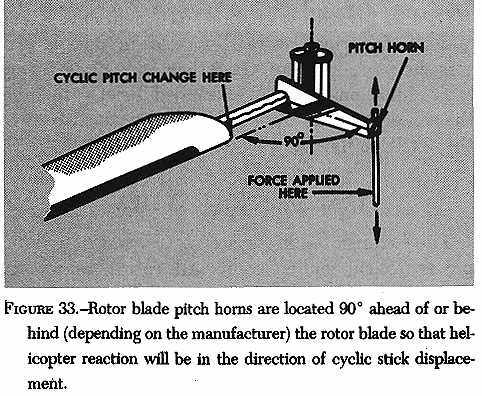 It might help to understand the relationship between cyclic stick movement and blade pitch change if the relationship between cyclic stick movement and the rotor blade pitch horn is understood. If the pitch horn is 90° ahead of the blade, blade pitch decrease takes place as the pitch horn passes the direction in which the cyclic stick is displaced. Blade pitch increase takes place as the pitch horn passes the direction opposite to the displacement. If the pitch horn is 90° behind the blade, blade pitch decrease takes place as the pitch horn passes the direction opposite to the displacement of the cyclic stick. Blade pitch increase takes place as the pitch horn passes the direction of displacement. In either case, however, blade pitch decrease takes place 90° ahead of cyclic stick position and blade pitch increase takes place 90° after passing cyclic stick position. Thus, maximum downward deflection of the rotor blades occurs in the same direction as cyclic stick displacement, and maximum upward deflection occurs in the opposite direction. As an example, when the cyclic stick is displaced forward, the swash plate nonrotating disc tilts forward and the swash plate rotating disc follows this forward tilt (fig. 35). Since the mechanical linkage from the rotating disc to the rotor blade pitch horns is 90° ahead of or behind the cyclic pitch change, the pitch angle is decreased as the rotor blades pass 90° to the pilot's right and increased as the rotor blades pass 90° to the pilot's left. Because of gyroscopic precession, maximum blade deflection occurs 90° later in the cycle of rotation. Thus, maximum downward deflection of the rotor blades is forward (same direction as cyclic stick displacement) and maximum upward deflection is aft, causing the rotor disc to tilt forward in the same direction as cyclic stick displacement. 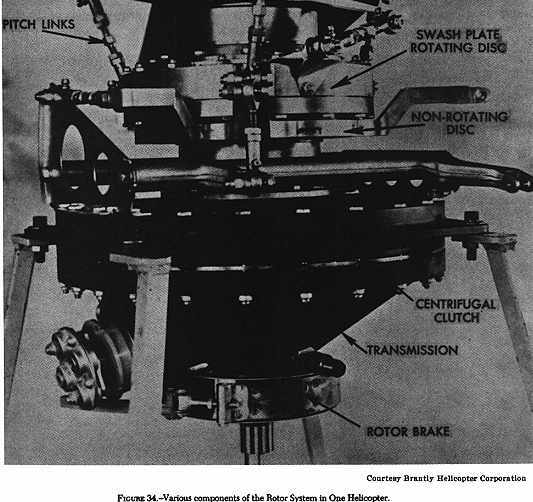 Figure 34 - Various components of the rotor system in one helicopter. There are three fundamental types of main rotor systems: fully articulated rotors, semirigid rotors, and rigid rotors. Fully articulated rotor systems generally consist of three or more rotor blades. In a fully articulated rotor system, each rotor blade is attached to the rotor hub by a horizontal hinge, called the flapping hinge, which permits the blades to flap up and down. Each blade can move up and down independently of the others. The flapping hinge may be located at varying distances from the rotor hub, and there may be more than one. The position is chosen by each manufacturer, primarily with regard to stability and control. Each rotor blade is also attached to the hub by a vertical hinge, called a drag or lag hinge, that permits each blade, independently of the others, to move back and forth in the plane of the rotor disc. This movement is called dragging, lead-lag, or hunting. The location of this hinge is chosen primarily with regard to controlling vibration. Dampers are normally incorporated in the design of this type rotor system to prevent excessive motion about the drag hinge. The purpose of the drag hinge and dampers is to absorb the acceleration and deceleration of the rotor blades caused by coriolis effect. Figure 37 points out the flapping hinges and drag hinges. The blades of a fully articulated rotor can also be feathered, that is, rotated about their spanwise axis. To put it more simply, feathering means the automatic and periodic changing of the pitch angle of the rotor blades. 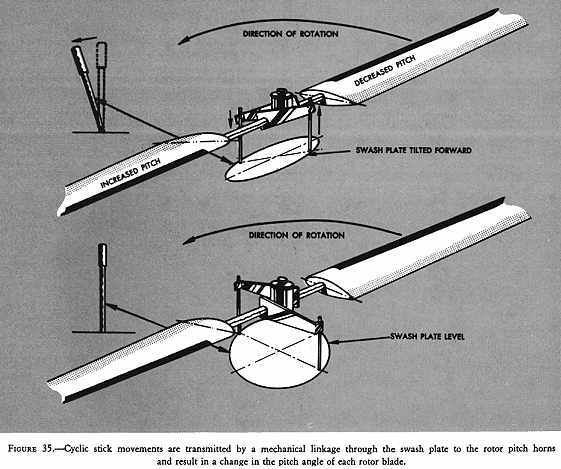 Figure 35 - Cyclic stick movements are transmitted by a mechanical linkage through the swash plate to the rotor pitch horns and result in a change in the pitch angle of each rotor blade. Summarizing then, each blade of a fully articulated rotor system can flap, drag, and feather independently of the other blades. In a semirigid rotor system, the rotor blades are rigidly interconnected to the hub, but the hub is free to tilt and rock with respect to the rotor shaft. The rotor flaps as a unit, that is, as one blade flaps up, the other blade flaps down an equal amount. The hinge which permits the flapping or see-saw effect is called a teetering hinge (fig. 38). The rocking hinge is perpendicular to the teetering hinge and parallel to the rotor blades. This hinge allows the head to rock in response to tilting of the swash plate by cyclic pitch control, thus changing the pitch angle an equal amount on each blade - decreasing it on one and increasing it on the other. The rotor blades of a semirigid rotor system may or may not require drag hinges depending on whether the system is "underslung." In an underslung system, the rotor blades lie in a plane below the plane containing the rotor hub pivot point. Because of coning, normal rotor operating RPM will place the center of mass of the rotor blades in approximately the same plane as the rotor hub pivot point. Consequently, the distance of the center of mass from the axis of rotation varies very little. Drag hinges are not needed since the hunting action can be absorbed through blade bending and the movement of the gimbal in the underslung system. Collective pitch control changes the pitch of each blade simultaneously and an equal amount, either increasing the pitch of both or decreasing the pitch of both. Summarizing, a semirigid rotor system can flap and feather as a unit. In a rigid rotor system the blades, hub, and mast are rigid with respect to each other. In this system, the blades cannot flap or drag but can be feathered. Extensive research is being done in this area and, at the time of this writing, two makes of rigid rotor helicopters have received FAA certification. 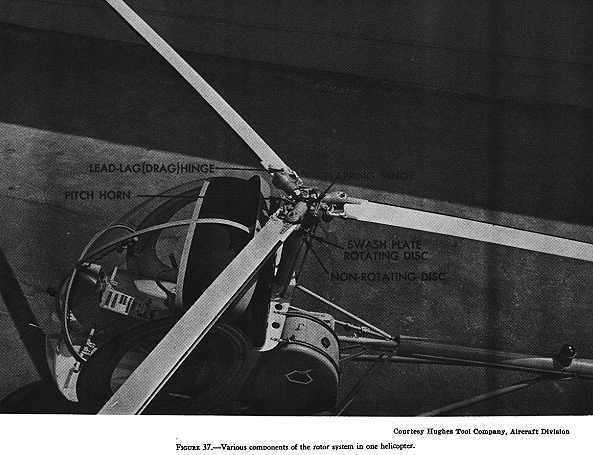 Figure 36 - Swash plate system for one helicopter. 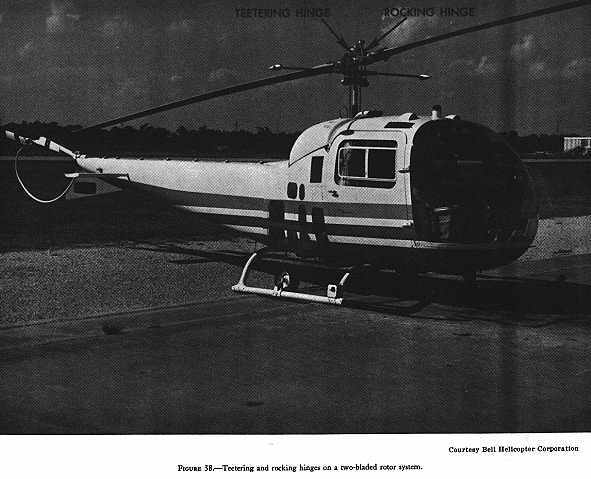 Figure 37 - Various components of the rotor system in one helicopter. Figure 38 - Teetering and rocking hinges on a two-bladed rotor system.